Mathew: I thought this was pretty fun, but Jill hated it. She said it was boring. Helm: What do women know of action films? Mathew: Well, to be fair, Jill usually really goes in for the action films. She loves to see a guy knock another guy senseless with a thrown shield, or see a dude jump out of a convertible onto the landing gear of an airplane as it takes off, or see a guy walk away without flinching as something huge explodes right behind him, or see a guy do a back flip out of the way of a bullet. She's into the action. Helm: What is your point? Your strumpet is not one of the reviewers here. Mathew: Look, I'm just saying that it's weird that Jill didn't like this movie more. I mean, she got up and went to the bathroom like halfway through. Helm: Perhaps her bladder is as weak as her morals. Mathew: Okay, I can see you're not taking this seriously, so I'm just going to have to analyze it myself. Helm: Or perhaps you could ignore it. Your skills at analysis are almost as poor as your skills as a warrior. Helm: Once the action actually got going. It did take ungodly long to get down to it. Mathew: That's true. The action didn't really take off for at least half an hour. Maybe that's what put Jill off. Helm: Enough about Jill! The harlot disgusts me. Mathew: Harsh. But you know, the point where it seemed like the movie really lost her was right at that point where you expect the action is finally going to kick in, but then, instead of that, there's like this unexpected diversionary sequence that goes on kind of long. Helm: I know the sequence of which you speak. Clearly, it was intended to be amusing and at the same time frustrating to Captain America, but I found it somewhat frustrating personally. Mathew: Yeah. Me too. It was kind of like the one wrinkle in the film. Mathew: You know, maybe that's what bugged Jill. Helm: Again with the slattern? Mathew: Look, maybe the issue was that the film kind of unfolds just like you'd expect. Even if you don't know the story, there really isn't anything that happens that's really surprising. I mean, it's got its share of funny lines and rip-roaring action, but it's kind of...I don't know... by the book. It's good, but it's no Iron Man #1, for instance. 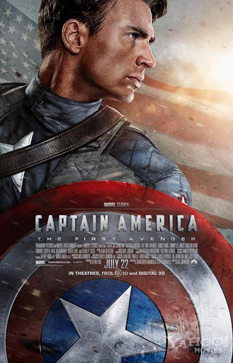 Captain America was enough for me, but maybe, you know, not for chicks? Helm: I cannot speak for "chicks", but I enjoyed it. I especially found the romantic element interesting and even poignant. Helm: Jill was too harsh in her estimation of this film. Helm: Leave her and let us never speak of her again. Mathew: Okay, that's an overreaction. Helm: You should have liked this film better. Mathew: I did like it. I just didn't love it. Helm: You were distracted by that wench and her unwanted opinion! Mathew: Look, I rate films on their own merit, not based on how my girlfriend reacts. Helm: Never bring her to the movies with us again.